Blurring borders between documentary and fiction, this film portrays a few moments from the lives of three men from Belo Horizonte: a transsexual prostitute and academic, a Hare Krishna soccer fan, and a would-be writer. Everlyn is a transsexual attending the Federal University of Minas Gerais and is working on her Masters about a hermaphrodite from the 19th Century. She wishes to be validated and loved with no prejudices. Ex-graffiti artist Murari is a celibate Hare Krishna who lives in a monastery. Lwei is an African with Portuguese roots who is writing several books at the same time, but never quite finishing any of them. One of these books is “Memories of Guaicurus St.” a chronicle of his weekly visits to a particularly seedy area of the city for a whole year. 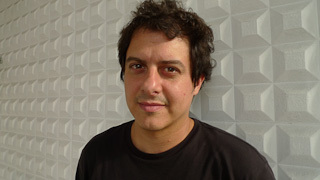 Sergio Borges’ award-winning films and videos have participated in many national and international festivals. His film O CEU SOBRE OS OMBROS won best film, director, editing, and script, as well as a Special Jury award for acting at the 43rd Brasilia Film Festival, and best film at the 22nd International Festival of Uruguay. He is also an accomplished photographer and artist, and a founding member of TEIA, a center for audiovisual research and production headquartered in Belo Horizonte, Brazil.